Her career has taken her to the world’s great opera houses and concert halls. The combination of her expressive, rich vocalism, elegant stage presence, and exciting theatrical abilities allows her to pursue a wide breadth of operatic portrayals and to delight audiences in concert and recital appearances. 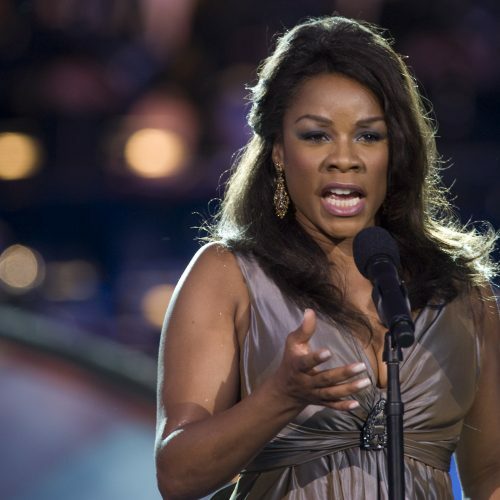 Denyce Graves has become particularly well-known to operatic audiences for her portrayals of the title roles in Carmen and Samson et Dalila. These signature roles have brought Graves to the Metropolitan Opera, Vienna Staatsoper, Royal Opera, Covent Garden, San Francisco Opera, Opéra National de Paris, Lyric Opera of Chicago, The Washington Opera, Bayerische Staatsoper, Arena di Verona, Deutsche Oper Berlin, Opernhaus Zürich, Teatro Real in Madrid, Houston Grand Opera, Dallas Opera, Teatro Colón in Buenos Aires, Los Angeles Opera, and the Festival Maggio Musicale in Florence. Graves’s 2012-13 season included two world premieres; she created the roles of Mrs. Miller in Minnesota Opera’s New Works Initiative commission of Doubt composed by Douglas J. Cuomo, and directed by Kevin Newbury, and of Emelda in Champion by Terence Blanchard at the Opera Theatre of St. Louis. The season also marked two role debuts for Graves as Herodias in Strauss’s Salome at Palm Beach Opera, and Katisha in Gilbert and Sullivan’s The Mikado with the Lyric Opera of Kansas City. Graves makes numerous concert and recital performances including at Opera Carolina, Arizona Musicfest, National Philharmonic, San Diego Symphony, and several prestigious universities throughout the nation. As Graves’s dedication to teaching the singers of the next generation continues to be an important part of her career, she currently serves as the Rosa Ponselle Distinguished Faculty Artist at the Peabody Conservatory in Baltimore. Denyce Graves made her debut at the Metropolitan Opera in the 1995-96 season in the title role of Carmen. She returned the following season to lead the new Franco Zeffirelli production of this work, conducted by James Levine, and she sang the opening night performance of the Metropolitan Opera’s 1997-98 season as Carmen opposite Plácido Domingo. She was seen again that season as Bizet’s gypsy on the stage of the Metropolitan Opera for Domingo’s 30th Anniversary Gala, and she made her debut in Japan as Carmen, opposite the Don José of Roberto Alagna. Graves appeared in a new production of Samson et Dalila opposite Plácido Domingo at the Metropolitan Opera, and she performed Act III of this work opposite Mr. Domingo to open the Met’s season in 2005. She was partnered again with Mr. Domingo in the 1999 season-opening performances of this work for Los Angeles Opera. She was seen as Saint-Saëns’ seductress with Royal Opera, Covent Garden and The Washington Opera, both opposite José Cura – the latter under the baton of Maestro Domingo, as well as with Houston Grand Opera. Her debut in this signature role came in 1992 with the Chicago Symphony at the Ravinia Festival under the direction of James Levine and opposite Mr. Domingo and Sherrill Milnes, and she made a return engagement to the Festival in this same role in 1997. Graves appears continually in a broad range of repertoire with leading theaters in North America, Europe, and Asia. Highlights have included a Robert Lepage production of The Rake’s Progress at San Francisco Opera, the title role in Richard Danielpour’s Margaret Garner in the world premiere performances at Michigan Opera Theater with further performances at Cincinnati Opera, Opera Carolina, and the Opera Company of Philadelphia, the role of Charlotte in Werther for Michigan Opera Theater opposite the Werther of Andrea Bocelli in his first staged operatic performances, and Judith in a William Friedkin production of Bartok’s Bluebeard’s Castle in her return to Los Angeles Opera: she also has sung Judith at the Washington National Opera and for the Dallas Opera. Highlights of the mezzo-soprano’s other recent appearances include Azucena in Il trovatore, Nicklausse in Les contes d’Hoffmann, and Dulcinée in Massenet’s Don Quichotte with The Washington Opera; Giovanna Seymour in a new production of Anna Bolena for Dallas Opera; the title role in La Périchole with the Opera Company of Philadelphia; a rare double-bill of El amor brujo and La vida breve specifically mounted for her by Dallas Opera; Federica in the Metropolitan Opera’s new production of Luisa Miller, led by James Levine; and Amneris in Aida with Cincinnati Opera. Graves’s debut with the Théâtre Musical de Paris – Chatelet was as Baba the Turk in a Peter Sellars/Esa-Pekka Salonen production of The Rake’s Progress, and she returned to Covent Garden as Cuniza in Verdi’s Oberto after her debut performances as Carmen. Her debut at Teatro alla Scala was as the High Priestess in La vestale led by Riccardo Muti, and she soon returned as Giulietta in a new production of Les contes d’Hoffmann and as Mère Marie in the Robert Carsen production of Les dialogues des Carmélites. She appeared at Teatro Bellini in Catania in the title role of La favorita, and audiences in Genoa saw her first performances of Charlotte soon after her debut there as Carmen. Her debut in Austria came as Carmen with the Vienna Staatsoper, and she has also been seen in this role with Grand Théâtre de Genève, Genoa’s Teatro Carlo Felice, the Bregenz Festival, and festivals in Macerata, Italy and San Sebastian, Spain. Graves gave her first performances of Adalgisa in Norma for Opernhaus Zürich. Denyce Graves has worked with leading symphony orchestras and conductors throughout the world in a wide range of repertoire. She has performed with Riccardo Chailly, Myung-Whun Chung, Charles Dutoit, Christoph Eschenbach, James Levine, Zubin Mehta, Lorin Maazel, Kurt Masur, Riccardo Muti, and Mstislav Rostropovich. Graves has appeared with the Atlanta Symphony Orchestra, Boston Symphony Orchestra, the City of Birmingham Symphony Orchestra, Houston Symphony, Israel Philharmonic Orchestra, Orchestre Philharmonique de Monte-Carlo, and National Symphony Orchestra among a host of others. In 2001 Graves gave a series of appearances in response to the tragic events in New York City, Washington, D.C., and Shanksville, Pennsylvania on September 11, 2001. Graves was invited by President Bush to participate in the National Prayer Service in Washington’s National Cathedral in which she sang “America, the Beautiful” and “The Lord’s Prayer.” This event was televised worldwide and was followed by Graves’s appearance on The Oprah Winfrey Show in a live musical program of “Healing through Gospel Music.” Graves has since participated in numerous other benefit concerts, and RCA Records released a recording of patriotic songs by Denyce Graves, the proceeds of which benefit various groups who have been affected by the events of September 11. Graves recently continued her patriotic activities when she sang for President and Mrs. Bush, among other dignitaries, at “An American Celebration at Ford’s Theatre” to benefit U.S. soldiers in Iraq. This concert was taped for television and aired on the ABC network on July 4, 2005. In 2003 Denyce Graves was appointed as a Cultural Ambassador for the United States, and she now travels around the world under the auspices of the State Department appearing in good-will missions of musical performances, lectures, and seminars. Her first trips in 2003 brought her to Poland, Romania, and Venezuela. Graves appears regularly on radio and television as a musical performer, celebrity guest, and as the subject of documentaries and other special programming. In 1997 PBS Productions released a video and audio recording titled, Denyce Graves: A Cathedral Christmas, featuring Graves in a program of Christmas music from Washington’s National Cathedral. This celebration of music including chorus and orchestra is shown each year on PBS during the Christmas season. She was seen on the Emmy-award winning BBC special “The Royal Opera House,” highlighting Graves’s debut performances there, and in a program of crossover repertoire with the Boston Pops, which was taped for national television broadcast. In December 1999 Graves participated in a concert given at the Nobel Peace Prize Awards in Oslo, Norway which was televised throughout Europe. As the only classical music artist to be invited for this event, she performed selections from her RCA Red Seal release alongside performances by Sting, Paul Simon, Tina Turner and others. She has been a frequent guest on television shows including Sesame Street, The Charlie Rose Show, and Larry King Live. In 1996 she was the subject of an Emmy-award winning profile on CBS’s 60 Minutes. In 1999 Denyce Graves began a relationship with BMG Classics/RCA Red Seal. That same year Voce di Donna, a solo recording of opera arias, was released on RCA Red Seal. The Lost Days, a recording with jazz musicians of Latin songs in the Spanish and Portuguese languages, was released in January 2003. In June 2003 Church was released – this recording, developed by Denyce Graves, brings together African-American divas from various forms of music, all of whom were first exposed to music through their upbringing in church. Participants recorded music of their choice and include Dr. Maya Angelou, Dionne Warwick, En Vogue, Patti LaBelle, and others. Other recordings of Graves include NPR Classics’ release of a recording of spirituals, Angels watching over me, featuring the mezzo-soprano in performance with her frequent partner, Warren Jones and an album of French arias, Héroïnes de l’Opéra romantique Français, with the Orchestre Philharmonique de Monte-Carlo under Marc Soustrot. Her full opera recordings include Gran Vestale in La vestale, recorded live from La Scala with Riccardo Muti for Sony Classical; Queen Gertrude in Thomas’s Hamlet for EMI Classics; Maddalena in Rigoletto with the Metropolitan Opera Orchestra under James Levine; and Emilia in Otello with Plácido Domingo and the Opéra de Paris, Bastille Orchestra under Myung-Whun Chung, both for Deutsche Grammophon. Denyce Graves is a native of Washington, D.C., where she attended the Duke Ellington School for the Performing Arts. She continued her education at Oberlin College Conservatory of Music and the New England Conservatory. In 1998, Graves received an honorary doctorate from Oberlin College Conservatory of Music. She was named one of the “50 Leaders of Tomorrow” by Ebony Magazine and was one of Glamour Magazine’s 1997 “Women of the Year.” In 1999 WQXR Radio in New York named her as one of classical music’s “Standard Bearers for the 21st Century.” Denyce Graves has been invited on several occasions to perform in recital at the White House, and she provides many benefit performances for various causes special to her throughout each season. Denyce Graves has been the recipient of many awards, including the Grand Prix du Concours International de Chant de Paris, the Eleanor Steber Music Award in the Opera Columbus Vocal Competition, and a Jacobson Study Grant from the Richard Tucker Music Foundation. In 1991, she received the Grand Prix Lyrique, awarded once every three years by the Association des amis de l’opéra de Monte-Carlo, and the Marian Anderson Award, presented to her by Miss Anderson. In addition Graves has received honorary doctorates from Oberlin College, College of Saint Mary and Centre College.